Well, half-an-hour to go until they raise the curtain. The house is filling up nicely. We have the creme de la creme of Washington society this evening. I hope the cast milks this for all its worth. Ha, ha, sometimes I kill myself. Hmm, I wonder where General and Mrs Grant are? The play's already started. Where's the President and his wife? People will soon be referring to him as the late Mr. Lincoln. Good evening Mr. President, Mrs. Lincoln. I'm John Ford, owner of this fine establishment. A lovely day isn't it? Are you all set for an evening of high drama? We have a confederacy of your favourites at the snack bar, Mr. Lincoln. I know you don't want to be a slave to your pet food indulgences but unshackle your hesitations and dig in. Would you prefer to be seated in the orchestra this evening, sir, or a Booth, perhaps? Shoot on over to Nicky and Mike at We Work For Cheese and see who else met Abe Lincoln today. 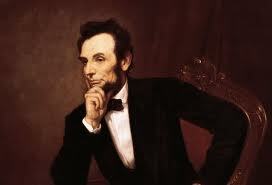 You must be anticipating the State of the Union address this evening by Our American Cousin. (It's not preempting Honey Boo Boo, is it?) I think I'll sit in the orchestra this evening... just to be on the safe side. I never did like those Booths. You know I've never seen this Honey Boo Boo person. I've only read about the characters in the show on those entertainment sites. Which do you think is more entertaining: Honey Boo Boo or State of the Union? Aww...you are not only #1 today, but King of the Punnys. I loved the "late Mr. Lincoln" and "Booth" remarks. Spot on! You are too kind, LM. I'm glad you enjoyed this. I had fun writing it. Oh god, dufus, the puns, they're killing me! Well, I guess my work here is done. You are a punny punny man! Dufus I think you've taken center stage with this one. It's who I am. Some say puns are the lowest form of humour. I say only if you didn't think of it first! Yeah, #1 with a bullet today, eh? Very clever way to weave your puns in...very clever in deed. Given the choice, and knowing how it came out..he should of stayed at the snack bar. Yes indeed. Who knew the evening would end with a bang! This is by far my all-time favorite story penned by Dufus! I am laughing at one pun when yet another one hits me. Too hilarious! I am going to have Lurch read this one. Thanks for pure entertainment, Dufus. That's the idea Boom Boom! I don't know if this if my favorite, but it sure was pun-filled ride. I think those were actually Abe's last words. If he could read this, I think Lincoln would be very proud of you, Dufus. Ok, maybe he wouldn't be but I am. And that's the important thing. "Would you prefer to be seated in the orchestra this evening, sir, or a Booth, perhaps?" You are a bad man, Dufus; I've said it before. Well, I took a shot. I thought you'd go for that. They tend to envelop(e) you don't they. The whole premise for this bit started with that line. The rest kind of just flowed. Is it any coincidence that FORD stands for Found On Road Dead? I think not, NoName, I think not. You fired off a whole clip, NoName. Again with the puns! I'm beginning to see you have a penchant for painful wordplay. I happen to have a great appreciation for puns (both good and bad ones), so I have a great affection for this post of yours. Funny stuff, Dufus. In a manner of speaking. Did I hit the target? Hey, easy. I once owned a Pinto. Never got rear ended, luckily enough. That's great KZ! I now have a fan base of one! Are you saying the guy doesn't have a sense of humour?